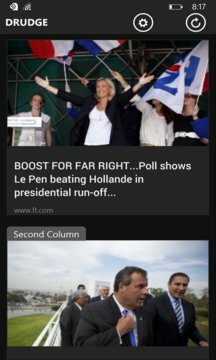 Drudge Report app is retrieving news feed from Drudge Report (http://www.drudgereport.com/). 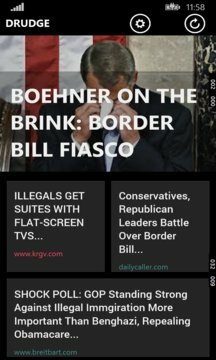 Which is mainly reports selected stories from the United States and international mainstream media about politics, entertainment, and current events as well as links to many columnists. * Full story articles and photos are optimized for easy reading on your mobile device. * News appears to load instantly. * Related news are grouped in the column. * Sharing of news using face book, twitter and etc..
* Green color source indicates latest headlines and Red color source indicates hot headlines .